Today in Anaheim, California, Star Wars Celebration 2015 kicks off four days of Star Wars fan festivities. In addition to a sneak preview ahead of the December release of Star Wars: The Force Awakens, fans will get the chance to finally find the droids they are looking for and participate in special “Jawa Scavenger Hunts” using free mobile apps developed by the R2-D2 Builders Club and using proximity beacon technology from Radius Networks. The R2-D2 Builders Club has developed two proximity-aware mobile apps for the Star Wars Celebration event. The first of these, the R2FID Scanner app, detects RadBeacon Tags installed on certain droids and displays information specific to the associated droid. The R2FID Scanner app also detects and displays information for vendors, convention-related items, and Rancho Obi-Wan items. The second of these, the R2FID Scavenger Hunt app, detects several special RadBeacon USBs that are installed throughout the convention center. Users who successfully unlock all of these locations in the Scavenger Hunt app can receive prizes from staff in the Droid Builders Room. 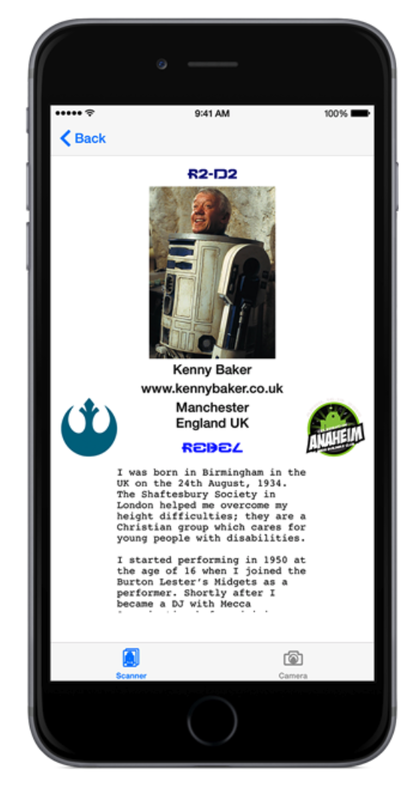 Using the free Droid Scanner mobile app, developed by the R2-D2 Builders Club, visitors will be able to detect droids equipped with RadBeacon proximity beacons from Radius Networks. Once identified, users of the Droid Scanner mobile app can interrogate each droid and uncover details of its maker, its service history and its role in the Star Wars universe. Using the free R2FID Scavenger Hunt mobile app, visitors will be able to participate in a special “Jawa Scavenger Hunt” hosted by the R2-D2 Builders Club. Based on the open-source scavenger hunt app from Radius Networks, this customized version of the Scavenger Hunt app detects beacons installed throughout the convention center and unlocks the associated location in the app. Each of the four days of Star Wars Celebration 2015, R2 Builders running the Scavenger Hunt will place several Radius Networks RadBeacon proximity beacons throughout the Anaheim convention center. When a user approaches within 1 meter of a beacon, the R2FID Scavenger Hunt mobile app will notify them that they have discovered a hidden “Jawa.” Users who find all of the “Jawas” and successfully complete the Scavenger Hunt can win special prizes including special Star Wars Celebration trading cards, bookmarks, pins, and more. The first participant to complete the Scavenger Hunt each day will receive a special poster designed by renowned artist Jamie Snell.